You can be as creative as you like when it comes to making a costume. Regardless of the materials you use, the most important aspect of making a costume is having an idea and seeing it through. These ideas can all be made quickly and easily, most using items you already own. 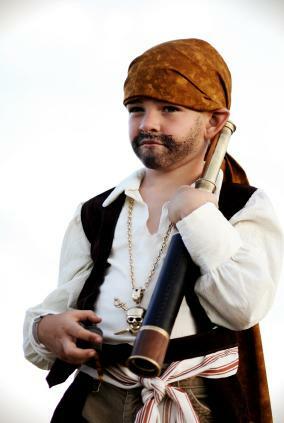 Pirate costumes are always easy to make. You only need a few basic ideas to pull together a great look. To make the costume, rip up the t-shirt and shred the bottoms of the jeans. The more tattered these items appear, the better. Tie the bandana on your head. Use eyebrow pencil to draw a beard on your face. Add a black eye patch, available at any party supply store, and any accessories to complete your look. Do you ever feel like you do too much laundry? Dressing up like a laundry basket just might be the costume for you. You will need just a few items for this creative costume. To make yourself into a laundry basket, first dress up in old sweat pants and a t-shirt. Cut the bottom out of a laundry basket big enough for you to climb into but just small enough to rest on top of your hips. If that is not possible, make straps on the laundry basket to place over your shoulders. Place some dirty laundry in the basket and you are ready to go. If you are looking for a couples costume idea, a static cling costume would go well with the laundry basket costume. You will need a few basic supplies to make this costume. Get dressed in black jeans and a black t-shirt or sweat pants and a shirt. Use the safety pins to pin clothing all over the outfit you are wearing. Spike your hair up with hair gel to finish the costume. The goal is to make it look like it is full of static electricity. 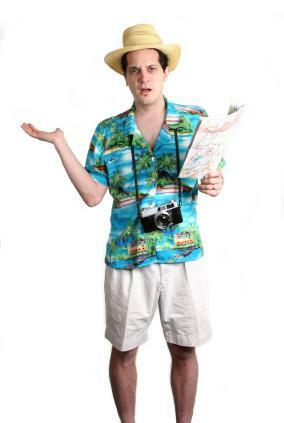 An easy costume idea is to dress up like a tourist. If you don't own a Hawaiian shirt, you can probably find a low-cost one at a thrift store. For the guys, wear a crazy Hawaiian shirt tucked into shorts with a belt. Wear a camera on a strap around your neck and carry a map in your back pocket. Women can wear a bright Hawaiian type dress with a big sun hat. Carry a straw bag on your arm. Wear a camera on a strap and consult your map often. Do you want everyone to say "Here comes bad news" when they see you? Everyone knows that bad news dominates the evening news on television and in the newspapers. A bad news costume has a double meaning in that your costume is literally bad news plastered all over your body. Dress in a simple outfit that won't distract from your news. Plain black jeans and a black t-shirt work fine. A simple sweatshirt and pants can be worn in cold weather. Cut out newspaper articles and tape them all over your shirt and pants. As an added touch, you can make a simple bad news hat from leftover newspaper. One of the easiest costumes to make is the old lady. Guys or girls can dress up as an old lady for Halloween or any party. Wear a dress or robe. Put curlers in your hair or wear a hair net. Carry a grandma purse and wear grandma eyeglasses. Powder your hair with flour or baby power. wear a gray wig. If you prefer, you could wear a gray wig. Toga costumes are very popular for college parties. A toga is a white gown draped over one shoulder that was worn by ancient Romans. Place one corner of the white fabric on your right hip or under your right armpit if you are female. Wrap the fabric all the way around your waist one time. Toss the end of the white fabric over your chest and drape it over your left shoulder around your back and over to your right hip again. Pin it in place with a large safety pin at your hip or under your arm. This cute cereal killer costume is quickly made from a few items that can easily be found around the home. To make the costume, begin by emptying all of the cereal boxes. Next, stab a plastic knife into each cereal box and glue it in place. Drip some red paint on the knives and boxes. Pin, tape or glue the cereal boxes all over a t-shirt. This costume is fun, easy and unique. To create a unique black eyed "P" costume, dress all in one color. Cut out a large letter "P" from black construction paper, and tape it on the front of your shirt. Circle one of your eyes with black makeup. Another simple and easy costume is a scarecrow. Dress in old jeans and a long sleeve button-up shirt. Stuff straw in the sleeves, collar, and leg openings of the shirt and pants. Glue straw to the underneath side of a hat so it pokes out around the edge. 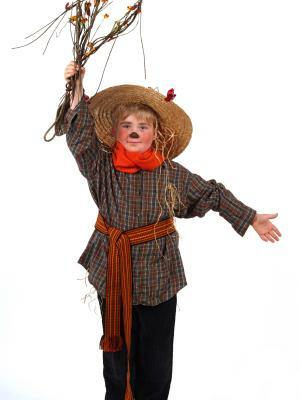 If desired, us makeup to create a scarecrow face, such as the one seen in Wizard of Oz. Zombie costumes are some of the cheapest to make. You just need a few items to pull off this costume. Distress the suit first by ripping it and adding holes, and then roll it around in the dirt. Glue or stuff the moss in the holes or wherever you like. Add some fake blood and you're almost set. Paint yourself up with white grease paint, then wipe it off and add green highlights. Finally, mess up your hair! Making a ghost costume is probably the easiest thing you can do. To make the costume simple, just take an old white bed sheet and drape it over your body. Figure out where your eyes will be and mark the spot. Remove the sheet and cut out eye holes. 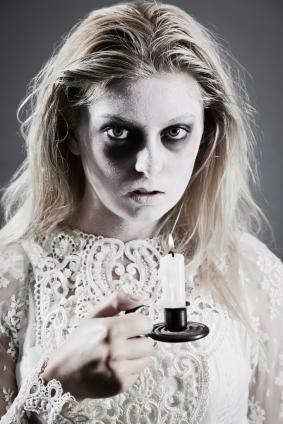 If you would like to dress as a ghost, but don't want to wear a sheet, it's easy to become a Victorian ghost. Place the dress or suit flat on the ground and spray adhesive all over it. Wait 5 minutes for it to get tacky. Sprinkle baby powder over the clothing and then shake off the excess. What you are left with is a ghostly item that looks like you stepped out of a grave. Complete the look with face paint to match. Sometimes the easiest costume to make is one from things you have in your closet. Look around and see what you have on hand to make a clever costume. The most important thing about dressing up is having a good time, so enjoy the experience, even if your costume is as simple as wearing a unique hat or mask.